Andrew’s amazing story is part of the continuing evidence that the vibrations of music are an invisible, indelible mechanism that has been used to heal us in many ways, for thousands of years. ANDREW & WENDY is a 30-minute documentary film about a quintessential New York upper West Side couple. 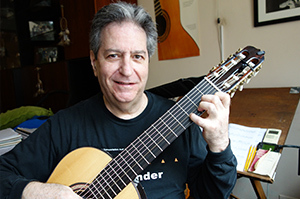 57-year-old Andrew Schulman, a classical guitarist, had a near catastrophic reaction to a blood transfusion, which resulted in him being put into a medically induced coma. His conditioned worsened in the ICU and his doctors tried every medical solution to heal him, to no avail. He was on his way out. Andrew’s wife, Wendy, asked the doctors what she could do. They told her his brain was still active, and she could talk to him, to try to connect. But after 2 days of her constant monologue — nothing. But then, exhausted, and distraught, she had an inspiration. 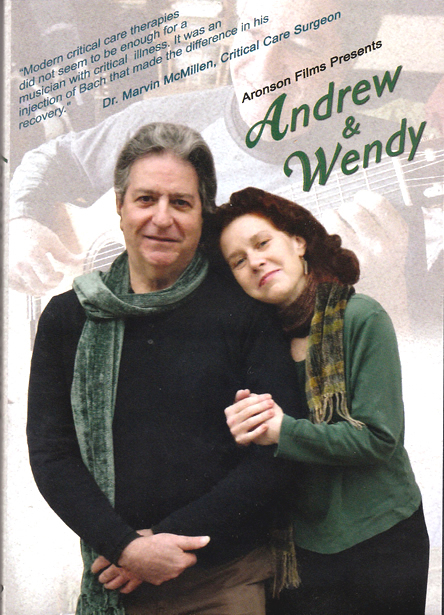 Wendy knew Andrew’s deepest connection to the universe was with music, not the sound of her voice. So, as a last ditch effort, she put headphones on him and played his favorite sacred music - Bach's 'St. Mathew's Passion.' Within hours doctors saw that Andrew’s body functions had stabilized, and the doctors reported he was coming back; he woke up a few days later. Remarkably, both his traditionally trained surgeons agreed that it was the music that turned him around. The Director of the Surgical ICU, Dr. Marvin McMillen, speaks eloquently in the film of the power of music to help to heal critically ill patients. “An ICU is about the world’s worst healing environment,” he says. Designed for science and medicine the antiseptic coldness and incessant beeping and hum of monitors and machines provokes anxiety and makes it difficult for patients and visiting family to be relaxed. Music is a normalizing influence that can offset these negative stimuli. And playing familiar music for patients clearly spirits them to a place in memory where they can relax. The benefits of this for healing are clear. Feeling this acutely after his time in the ICU, as a giveback Andrew decided to bring music to patients in this harsh medical environment. He was welcomed as the Resident Visiting Artist at Beth Israel Medical Center where he now plays 3 days a week. While in a coma, Andrew’s heart stopped for 2 minutes, and in brain ischemia for 17 minutes, which he later found out caused a near total loss of his music memory. Some of his playing ability and 10 hours of memorized music was gone. But, as his neurologist later explained, his mission to bring music to the ICU served as excellent neuro therapy so what might have taken him 5 years to recover, came back in half that time.